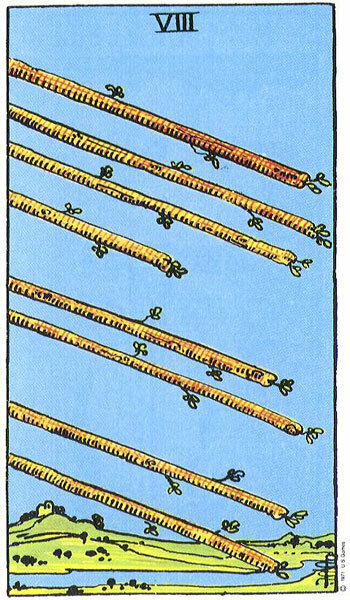 The Eight of Wands has a need for speed. 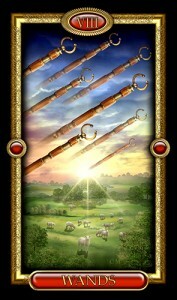 This card marks the end of a period of delay or roadblocks, and implies a quickening of all affairs. You’re reaching your goal quickly, good news is heading your way – in fact all areas of communication are working smoothly. It’s all coming together, and if you’re fast on your feet when new opportunities arrive out of the blue, you could experience something that changes your life. 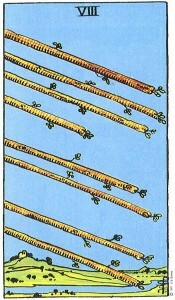 In a reading, the Eight of Wands urges you to buckle up, because you’re heading into the fast lane. You should expect a letter/email/phone call soon or you might be asked to take a trip related to your profession or job. Synchronicities are everywhere, and networking is effortless. You make new friends or strike up a new romance, your health improves quickly, you response to new information with speed and skill. Everything is clicking for you! Mar 19, 2019: Demon Bewitched is Here! Sep 19, 2018: Are you ready for The Red King? Mar 13, 2018: Getting ready for Wilde Fire! Nov 22, 2017: My new cover for RUNNING WILDE is here! Aug 24, 2017: Call of the Wilde has a cover…and launches Sept 5! May 17, 2017: Hello, Wilde Child, welcome to the family! Apr 06, 2017: A Brand New Cover for WILDE CHILD! Nov 20, 2016: Cover Reveal – Forever Wilde! Aug 06, 2016: A Cover for ACES WILDE! © 2019 Jenn Stark. All rights reserved.